Putting on a few pounds is all too easily done. In fact, over half of all adults in Northern Ireland are officially overweight or obese - that’s usually down to a mix of poor diet, too much alcohol and not enough physical activity. This can lead to serious health problems such as some cancers, heart disease and type 2 diabetes. Having a bigger waist size increases the risk of developing these conditions. So it’s important to measure up and see what your waistline is. A aist circumference bigger than those listed below puts you at greater risk of ill health. Similarly, European women are described as being at high risk of developing these serious illnesses when they have a waist measurement of about 35 inches or more, and for Asian women when their waist measurement is about 32 inches or more. Watch our simple self-measurement guide. To work out if you are overweight or obese and at increased risk of developing health problems, you need to measure up. As well as checking your weight and body mass index, it's also really important to measure your waist size. keep the tape measure snug but not tight around your waist, and write down the result. A waist size of 37 inches or more indicates that you have an increased risk of health problems. A waist size of about 40 inches or more indicates that you have a high risk of health problems. For Asian men, a waist size of about 35 inches or more indicates that you have a high risk of health problems. A waist size of about 32 inches or more indicates that you have an increased risk of health problems. A waist size of about 35 inches or more indicates that you have a high risk of health problems. For Asian women, a waist size of about 32 inches or more indicates that you have a high risk of health problems. Your body mass index or BMI is calculated using your weight and height measurements, as people’s ideal weight varies according to how tall they are. Using a simple online BMI calculator can tell you whether you are underweight, overweight or around the right weight for your height. If you would prefer to calculate your BMI using metres and centimetres, you can use the NHS calculator here. 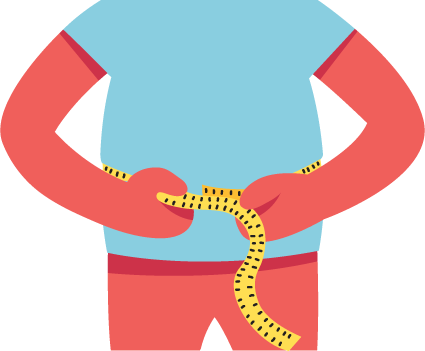 Enter your height and weight into the calculator on the right to calculate your BMI. You can also check your height and weight against the chart above to find out if you health is at risk. Remember, just as being overweight is not healthy, being underweight can increase your risk of some health conditions, such as osteoporosis and infertility. If you are underweight, the first step is to visit your GP for help and advice. Three of the main health problems caused by obesity – and the lifestyle factors associated with it - are cancer, heart disease and type 2 diabetes. Here’s a little more on those problems and how to protect against them. Cancer is a condition where cells in a specific part of the body grow and reproduce uncontrollably. The cancerous cells can invade and destroy the surrounding healthy tissue – including major organs. Sadly, cancer is still one of the main causes of death in Northern Ireland; yet many of those deaths are actually preventable. Smoking, unhealthy eating, high alcohol consumption, increasing age and some environmental factors can all play a part in increasing the risk of some cancers. Cancer Research UK (https://www.cancerresearchuk.org/) has found that more than four in ten cancers could be prevented with lifestyle changes. Being overweight or obese is the largest preventable cause of cancer after smoking. If trends continue, by 2043 excessive weight could cause more cases of cancer in women than smoking. Eating more fruit and vegetables and more wholegrain products can help reduce the cancer risk. Some research highlights that eating high amounts of red and processed meat can increase the risk of developing some cancers. It is recommended that people who eat more than 90g of red or processed meat each day (or 630g of these over a week) should consider reducing this to around 70g/day (490g/week). Ninety grams is equivalent to a 3oz steak, or three thin slices of beef, lamb or pork, where each slice is roughly the size of half a slice of bread. A cooked breakfast containing two standard sausages and two rashers of bacon is equivalent to 130g. Being more active can also help prevent cancer – even just 30 minutes of moderate activity most days of the week (at least 150 minutes each week, in bouts of at least 10 minutes) can make a difference (eg a swim, a cycle ride or even just a brisk walk to the shops). The heart is effectively your body’s pump. It keeps blood moving round the body through arteries and veins to deliver the oxygen and nutrients needed to help your body function. Sometimes however, the arteries narrow and when this happens to the arteries of the heart, they can get blocked up, leading to heart disease. The risk of developing heart disease can be increased or decreased depending on a number of factors including whether you smoke or not, how physically active you are, your diet and your weight. Diabetes is the name for a condition that occurs when the body can’t produce any or enough insulin (a type of hormone) to control the amount of sugar being carried in the blood. There are two main types of diabetes – type 1 and type 2, with type 2 the most common. In many cases, that’s a result of being overweight or obese. You can protect against developing type 2 diabetes by maintaining a healthy weight (within a BMI of 20–25). Healthy eating and an active lifestyle both play a part – at least 30 minutes of moderate physical exercise most days (at least 150 minutes each week) makes a difference. This can be divided up into bouts of at least 10 minutes (and that can be something as simple as a brisk walk to the shops). If you do have diabetes, it’s very important to follow the correct treatment as advised by a doctor, dietitian or diabetes nurse. It’s easy to put on pounds throughout life, as our TV ad shows. But that can lead to serious health problems that affect your quality of life. Take a look to find out more. Video of Are You Inching Towards Bad Health? If your waistline’s been creeping up on you it can lead to health problems as these TV ads show. If you think you could be inching towards bad health then download our special information leaflet, which is packed with tips and advice to help you keep your weight and waistline healthy.